Hundreds of people at Bailick Park in Midleton to attend the dedication of the monument to the Choctaw Nation. 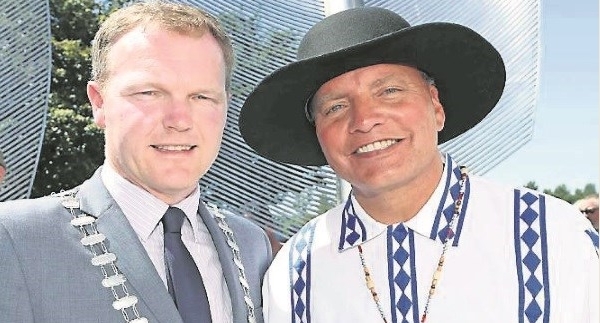 The Irish people and the Native American Choctaw nation are bonded by the difficulties they have endured in their respective cultures and the resilience they have shown to overcome hardships, the Chief of the Choctaw Nation told a gathering in Co Cork yesterday. 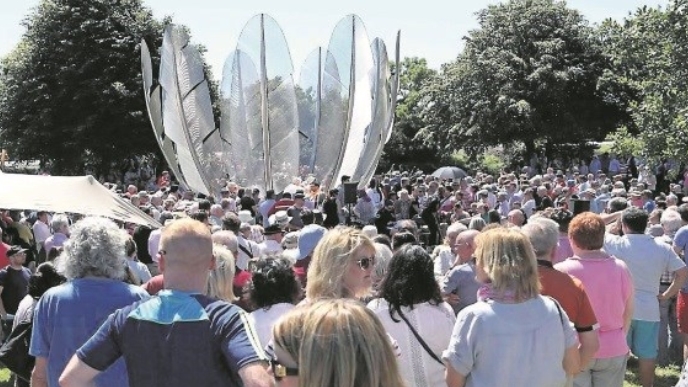 Chief Gary Batton told of the similarities between the two people as a special feather sculpture was unveiled in Bailick Park, Midleton, Co Cork. The ‘Kindred Spirits’ sculpture commemorates a donation made by the Choctaw people to Ireland during the great famine. Chief Gary Batton said he became emotional when he saw the sculpture. “The people in Ireland know how to get a gathering together. It is hard for me to express what a great honour this is this tribute to our Choctaw ancestors. I can’t tell you the feelings it gives to me to see it in person. Meanwhile, the Mayor of Co Cork, Cllr Seamus McGrath said the Irish people were very grateful for the “kindness of strangers” during the great famine. Close to 20 representatives from the Choctaw Nation from Oklahoma attended the public ceremony. It included traditional Choctaw and Irish music and dancing, as well as activities around the sculpture and the story. 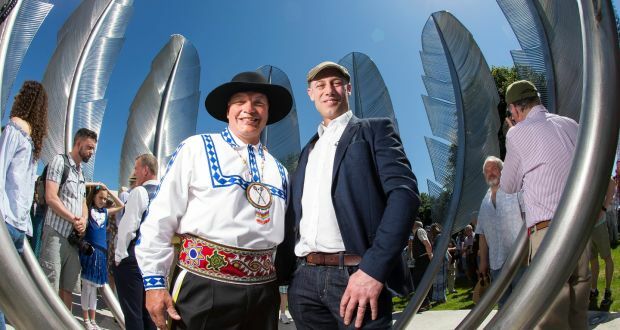 ‘Kindred Spirits’, by Cork based sculptor Alex Pentek, was commissioned in 2013 by the former Midleton Town Council to commemorate the time in 1847, when the kind people of the Choctaw Nation of Oklahoma heard of the suffering of the starving Irish. They responded, with greatness of spirit and generosity, by contributing a sum of $170 dollars (about $4,400 today), to send food aid to Ireland. This show of solidarity came despite the great hardships being faced by the Choctaw people themselves who were also living in conditions of starvation and poverty, and who had just a few years previous endured the Trail of Tears. The sculpture comprising of nine, majestic 20 foot eagle feathers reaching towards the sky in the East Cork town, arranged in a circular shape, represents a bowl filled with food, presented to those suffering hunger, metaphorically speaking. 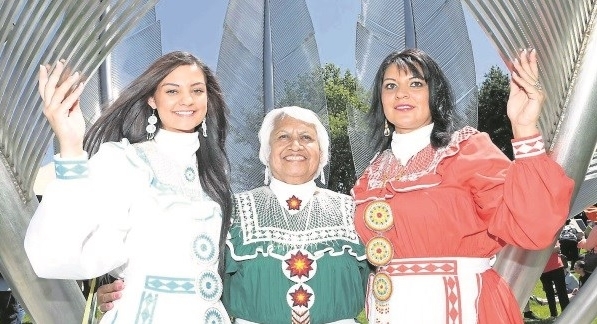 This is not the first time the Choctaw Nation has been honoured in Ireland. In 1990, Choctaw leaders travelled to Mayo to take part in a re-enactment of an 1848 protest. The gesture was returned in 1992, when Irish leaders took part in a trek. Former President Mary Robinson also has been named an honorary Choctaw chief. Responses to "Hundreds of Irish gathered to give thanks to the Native Americans that saved them"
I never knew about the Choctaw Nation aiding the Irish during this time of starvation at the hands of the English. I'm so overwhelmed to learn this, and so thankful for the help. I am part Irish, Mississippi Choctaw, Kentucky Cherokee and Apache. We have known this story all of our lives. My hope is to see this sculpture in person one day. Aho! Wado! Chahta sia hoke/I am Choctaw! I am proud of my people. And I am grateful for our Irish brothers and sisters. A beautiful story. I have heard it often told. Love and respect to the Choctaw nation. Dublin Ireland. "It has been both an honor and a challenge to represent this history that one one hand tells a story of unimaginable suffering of both our nations, and also of the the tenderness and kindness of the Choctaw nation. Middleton town clerk Joe McCarthy said to me that this act of charity was of national and international importance, where politics were brushed aside for a humanitarian cause by the Choctaw, and that this was the beginning of a new era of higher international human consciousness..."